A visit to Muckross Traditional Farms is an enjoyable and informative way to while away a few hours in a beautiful part of Killarney National Park. Situated in the majestic surroundings of Muckross House & Gardens, the traditional farms provide a real-life glimpse at what life in Ireland was like in the early part of the twentieth century. This is not a museum tour in the traditional sense. It is a working farm that utilises the tools and practices of the time to re-enact a way of life that is slowly fading from memory. The farm is made up of three different sized farmhouses to represent small, medium and large holdings. Each farmhouse hosted by a “bean an tí” or woman of the house. Traditional baking skills are demonstrated and you will also be given a detailed insight into the lives of rural Irish families of the time. This live interaction with real people is one of the things that brings this tour to life. There is usually ample opportunity to ask questions and get a feel for the history of the place. Located about 6km outside of Killarney town, Muckross Gardens and Traditional Farms can be reached by various forms of transport. There is a paved path from the outskirts of the town that goes through the National Park all the way to the farms. The path is shared by walkers, cyclists and the traditional jaunting cars. Jaunting cars can be hired from the town centre and there are a number of locations to rent a bicycle if you need one. There is ample car parking right outside the entrance to the farms, with an overflow car park in use during the busy summer months. There are also a number of buses stopping at Muckross House. For something different, you can arrive via boat from Dinis at the other end of Muckross Lake. It is important to remember that the site of the farms is quite large – covering several acres. It is possible to stroll around the site and amble from location to location. However, you may want to take advantage of the free shuttle bus that loops around the site. You can hop on and hop off as you wander around the farms. On our first visit there a few years ago, I set off with two toddlers and no buggy. Not a good idea! For little legs, there’s a lot of walking so make sure you plan for this if you have small children with you. There are toilets at the ticket office/shop where you start the tour and also at the large farmhouse in the middle of the site. From magnificent workhorses to pigs, hens and cows, you will find plenty of farm animals for company on your visit. Wild rabbits abound on the grassy slopes and a petting farm will be a hit for the younger visitors. If you are travelling with young children, there is a lovely little playground at the far side of the site. This is a great spot to take a break (for the adults!) and return back to the 21st century momentarily. A great thing about the Muckross Traditional Farms is that you are getting a healthy dose of fresh air in between each attraction. Granted, the shuttle bus can take you along some of the way, but it is lovely to stroll between the farmhouses and along the rural laneways of the farms. Although it is situated only minutes from the main carpark for Muckross House and Gardens, it really a great place to escape to a bygone era. 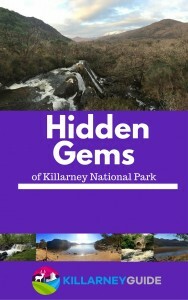 And the many walks and hikes of the Muckross Peninsula are just a short stroll away. Like any good tour, there is an opportunity to spend some money again at the end. The shop at the Traditional Farms is well stocked with souvenirs and gifts as you would expect. You can also get teas/coffees/ice creams and snacks as well as some advice on what else you can do in and around the Muckross house area. The Schoolhouse regularly hosts events and is a lovely intimate venue for story or song. You will leave the farms feeling like you have taken a step back in time to a simpler time. Simple in the sense that people had less possessions. Simple in the sense that people had simple goals – to feed and shelter a family. What were not so simple were the tasks and activities people had to perform to survive. It was a tough, physical existence and people worked hard to put food on the table. So as well as an informative and fun way to pass an afternoon or morning, you will also leave with a renewed sense of gratitude for the world we live in today. It may not be perfect, but we have come a long way since the times portrayed by those working the Muckross Traditional Farms. thanks for the comment Kay and enjoy the visit to Muckross this weekend!